Griffon GPS is an online planning tool which produces a comprehensive degree audit and reviews past, current and planned coursework to help students and advisors monitor progress toward degree completion. The audit displays the courses required to achieve a student’s degree in an easy to read format. Griffon GPS is not a substitution for consultation with a professional academic advisor. Log In to Griffon GPS Today! Griffon GPS is an online planning tool which produces a comprehensive degree audit and reviews past, current and planned coursework to help students and advisors monitor progress toward degree completion. The audit will display the courses you must complete to achieve your degree in an easy to read format. Griffon GPS is not a substitution for consultation with a professional academic advisor. Who will be able to use Griffon GPS? Students, faculty, advisors and selected staff will have access to the information contained in Griffon GPS. How can I access Griffon GPS? Griffon GPS can be accessed through your Goldlink account (https://goldlink.missouriwestern.edu/). What are the benefits of Griffon GPS? Will help determine what requirements you need to fulfill in order to complete you degree. Allows you to view individual course grades, major GPA and overall GPA. Determines how your transfer credit hours may fit into your degree. Will show you how departmental substitutions and waivers will apply to your major, concentration or minor. Will allow you to apply your current credit hours to a different major, concentration or minor. When should I use Griffon GPS to process a degree audit? Before you meet with your academic advisor to discuss registration for an upcoming semester. After you register to ensure that the courses you selected applied to your requirements like you thought they would. After your grades for each semester are posted. Any time you make a change to your schedule or major, concentration or minor. Prior to applying for graduation. Your degree audit lists your academic information related to your degree progress. It displays courses required and completed for your degree program in “blocks” (e.g. Degree, General Studies, Major, etc.). Your transcript is your official university academic record and provides a chronological list of courses completed at MWSU, the coursework you have transferred to MWSU and other academic information. Your audit will outline courses needed to meet degree, major, minor, and/or concentration area requirements within each specific block. You may use this information to discuss your semester course plan with your academic advisor. Can I see a list of all of the classes I’ve taken? Yes. On the Worksheet tab, click on the Class History link at the top for a list of courses taken at Missouri Western and courses taken at transfer institutions. Can I register for classes using Griffon GPS? No. You must register through your Goldlink account, Student Academics tab. Does Griffon GPS include my transfer work and other non-traditional credit (e.g. AP, IB, CLEP, military credit, departmental credit, etc.)? Yes. Once any coursework not taken at MWSU is evaluated it will appear in your student record and in your degree audit. The only exceptions will be if you have coursework earned at MWSU prior to Summer 1985 and if you have older bulked transfer coursework. Contact your advisor or the Registrar’s Office with questions. Are my grades visible in Griffon GPS? Yes. Mid-term grades are listed in the Class History link and once final grades have been processed at the end of the semester, they are viewable in the Griffon GPS audit. Courses which are in-progress are listed with an “IP” grade. How current will my information be in Griffon GPS? The information in Griffon GPS is refreshed each night. Any changes made today (e.g., grade changes or classes added/dropped) will be seen in your degree audit tomorrow. My advisor petitioned to waive/substitute a course. How will that course appear in Griffon GPS? After an exception to the standard requirements is approved by the Department Chair and the Dean of the given college/school the information is forwarded to the Registrar’s Office for entry into your student record. After the nightly refresh, the change will appear on your degree audit and an additional line will appear under it that explains why the exception was entered. How does Griffon GPS decide where to place courses that I’ve completed? Griffon GPS looks at your program holistically, and places each course using a “best fit” scenario. The “best fit” process will not always be perfect, particularly when multiple possibilities exist. Classes may apply to different blocks as you take more courses. If you have a course that does not appear in the area in which you expected, please contact your advisor for assistance. The “What If” function allows you to hypothetically change your major, concentration or minor. The “What If” degree audit will show you what coursework is required for the new major, concentration or minor, what courses you have taken that satisfy requirements, and what courses are still left for you to take. My degree audit is not displaying. Why? The audit will not display correctly if you have not declared a major. Please use the “What If” feature and contact your advisor in order to officially declare. What does the “Credit Hours – Applied” include at the top of the audit? The audit engine presumes you will successfully complete all the classes you are currently enrolled in so this number includes all of those credits. However, if you withdraw from a class mid-semester, those credits will not be removed from this number until the ‘W’ is processed at the end of the semester. These are the hours applied toward the 124 hours to graduate. I’ve seen some symbols on my audit I don’t understand. The legend on the left hand side of Griffon GPS should answer all your questions about the meaning of all the various symbols. Please contact the Degree Audit Coordinator in the Registrar’s Office with any further questions. How do I know who my academic advisor is? Your academic advisor is listed at the top of your degree audit. If you hover over the name your advisor’s email address and office phone number will appear. If there is no academic advisor listed please contact the Student Success and Advising Center. If you want to change your advisor please contact the department with whom you want to be advised for an appointment. Griffon GPS placed one of my courses in two different places. Is that okay? In most cases, yes. Griffon GPS is programmed to recognize that some courses can fulfill more than one requirement. If you have any questions, contact your advisor. I repeated a course and I don’t understand how it appears on the degree audit. If you successfully repeat a course, only your last attempt counts toward degree requirements. The earlier attempt(s) will be placed in the “Insufficient” block at the bottom of your audit. The courses in this area do not count toward your total hours, and they cannot be used to fulfill requirements. I’m pursuing two degrees (a BFA and BS, etc.). Only one appears on the audit. How can I check the requirements for my other program of study? The “What If” function allows you to hypothetically change your major, minor, or concentration. The new “What If” audit will show you what coursework is required for this degree, major, or concentration, what courses you have taken that satisfy requirements, and what courses are still left for you to take, but the “What If” cannot accommodate showing two majors at the same time on the audit. To actually change your current major or add a second major, contact your academic advisor. I think my degree audit is incorrect. What should I do? My major/concentration/minor is wrong or missing on my degree audit. If you have not officially declared or you have changed your major, concentration or minor, contact your advisor for instructions. The requirements for my major are wrong. Look at the catalog term that appears on the major requirements block of the degree audit. According to university records this is the catalog that you are using to complete your major requirements. If you believe you should be using older or newer catalog requirements, contact your advisor. My transfer courses don’t appear in the right place. If you are concerned about a transfer course appearing in the audit or applying toward a particular requirement in the audit, contact your advisor. Courses are not applying in the “right” place. Griffon GPS uses a ‘best fit’ approach for meeting requirements so classes may apply to different blocks as you take more courses. If you have further questions, please contact your advisor. Courses are missing from my degree audit. There may be a couple of reasons courses are not being displayed. If you have repeated a course that is not approved to be repeated for credit, only the most recent attempt will be included in your degree audit. If you have coursework earned at MWSU prior to the Summer of 1985 these credit hours will not be included in your degree audit. Contact your advisor or the Registrar’s Office with questions. My advisor or department chair gave me permission to substitute or waive a course requirement, but it’s not showing on my audit. Talk with your advisor. Advisors can request an exception to the standard requirements. If exceptions are approved by the Department Chair and the Dean of the given college/school the information is forwarded to the Registrar’s Office for entry into your student record. At this point, the change will appear on your degree audit. I am repeating a course I previously passed, but my first attempt is appearing as insufficient on my degree audit. Repeated courses will appear in the “Insufficient” block until the final grade has been posted at the end of the term. If none of these concerns describe your situation, or if you need additional help identifying what’s wrong, contact the Degree Audit Coordinator in the Registrar’s Office. I have submitted an application for graduation, but Griffon GPS says that I haven’t completed all my requirements. Does this mean that I won’t be able to graduate? Not necessarily. This can be a timing issue such as posting of grades for the current term. If you have followed through on the requirements you were told to complete on your degree checklist emailed to you by the Registrar’s Office, you should still be on track for graduation. Contact your advisor or Graduate Coordinator in the Registrar’s Office as soon as possible. Are there requirements for graduation that Griffon GPS doesn’t check? A few. While Griffon GPS has been designed to check almost everything that you must complete to qualify for graduation, there may be additional requirements for your major that must be completed as well. 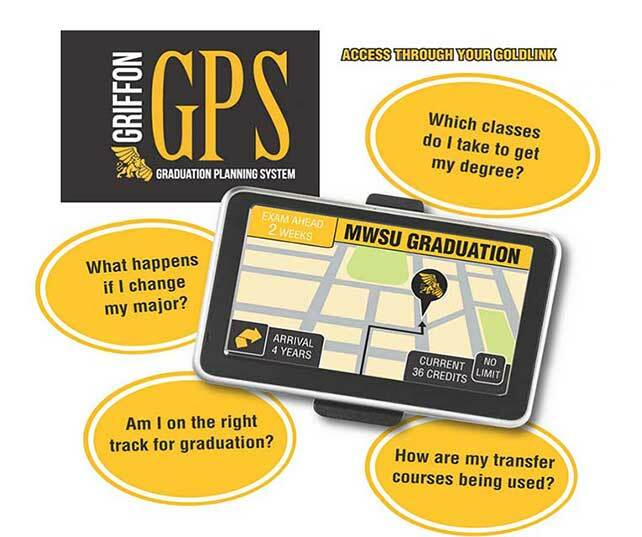 You should use Griffon GPS in conjunction with MWSU’s catalog and any information that your major department provides to ensure that you remain on track for graduation. If you have questions about any additional requirements for your major, talk with your advisor.